In the course of the recent ugliness about sexism, racism and homophobia in the SFF community, I also decided to talk up more good books that go beyond the limits of straight, white, male and Anglo-American. 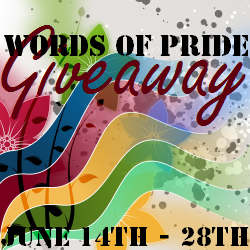 For I am proud to present you the Words of Pride Giveaway of books with GLBTQ themes, which was organized by lesbian romance author Hildred Billings. The giveaway runs until June 28th and includes more than twenty indie books with GLBTQ themes in various genres and formats. There’s fantasy, there are romances, there’s erotica, there is YA and NA, there is historical fiction. Oh yes, and a little story of mine called Outlaw Love. So enter if you want a chance to discover some great indie fiction away from the heterosexual mainstream for free. And since there are so many great books on offer, maybe you’ll even find a few you want to buy. This entry was posted in Books, Links and tagged e-books, giveaway, GLBT, my books, other people's books, signal boost. Bookmark the permalink.